Duff, State Senator Will Haskell (D-26) and State Representatives Tom O’Dea (R-125), Chris Perone (D-137), Jonathan Steinberg (D-136th), Terrie Wood (R-141st), Laveille and Dathan participated in the breakfast panel at the DoubleTree hotel. State Rep. Travis Simms (D-140) was invited but did not attend. Carey, AT&T external affairs Director, asked Duff about the state’s economic course, referencing the “somewhat-controversial” appointment of David Lehman as Department of Economic and Community Development (DECD) Commissioner, and the news that GE Capital is moving out of Merritt 7, as has Diageo. 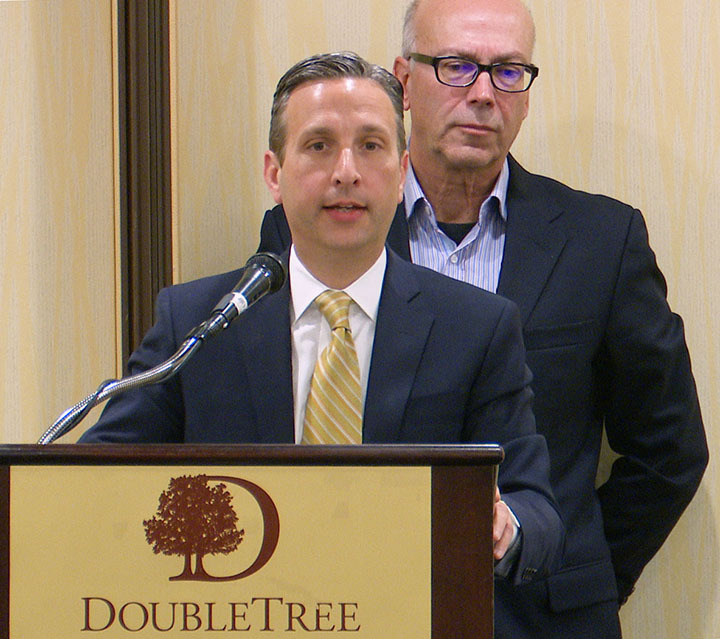 State Senate Majority Leader Bob Duff (D-25) speaks Thursday in the DoubleTree Hotel as Harey Carey listens. Lehman did “very well” in front of the Finance Committee but it takes time to learn the job, Duff said, noting that Lehman is a “private sector business person” coming into state government. Lavielle said she likes Lehman very much but she’s troubled that she’s seeing an emphasis on attracting tourism but little on efforts to attract new business. “I was extremely impressed (by Lehman) and I do feel he is going to be looking at how we are going to be more successful and bringing in businesses to our state,” Dathan said. Four contracts have come before the Appropriation Committee, regarding four groups of state employees who want to join a union and have their pay and benefits adjusted under the 2017 SEBAC (State Employee Bargaining Agent Coalition) contract, Lavielle said. She predicted six more groups will come forward during this legislative session. The employees will, in the coming two years, get an 11 percent raise and a $2,000 one-off payment. Assistant Attorney General managers will get a $6,000 bonus in the first year and $12,000 in the second, she said. “It’s very hard to imagine anybody in the private sector getting guarantees like this,” Lavielle said Thursday. The state workforce is 13% smaller than it was eight years ago, the “the smallest workforce per capita since the 1960s,” Duff said. The 2012 and 2017 SEBAC contracts save $20 billion each over 20 years, and the assistant Attorney Generals haven’t had a raise in 20 years so they decided to unionize, he noted. Tolls are part of a larger conversation about how the state will fund infrastructure improvements going forward, Perone said, observing that the issue has been a political football for years but this time, there are concrete plans moving forward. The Transportation Fund is going bankrupt and revenue is needed to make it self-sufficient because “we can’t drive on crumbling roads to get to crumbling schools because that’s what’s going to happen,” Perone said. The budget that Republicans wrote two years ago to initial bipartisan approval, before being vetoed, would have funded the Transportation Fund, O’Dea said. Lamont planned to take car sales taxes out of the Transportation Fund, a $300 million hit, he claimed. “I support tolls in concept. I want to see efforts to stabilize our economy first,” Wood said. “Too often, the politically expedient thing to do, and the thing that legislators have done for decades, is fail to make an upfront investment,” Haskell said. The freshman senator said that there’s bipartisan agreement that Connecticut’s infrastructure needs to be updated. He asked if they thought the legislature would approve a budget by the scheduled end of the session. Are they in favor of legalizing marijuana? The Judiciary Committee last week approved three bills that would legalize possession of cannabis for adults 21 and older and expunge prior drug convictions, according to a CT News Junkie report. Employers can’t fire people for testing positive for marijuana because habitual use results in higher blood levels and you can’t tell when someone has been smoking, he said, relating stories he’s heard about Colorado. “Back in college I smoked… but what we’re talking about now is not your grandfather’s marijuana. This is a genetically engineered plant,” Steinberg said. He’s “concerned and alarmed” that the bill hasn’t come to the Public Health Committee, which he chairs. Lavielle agreed with Steinberg on his idea regarding process. “I think this is irresponsible to be doing something like this just for revenue,” she said. Marijuana stays in the bloodstream for 30 days, which makes it difficult to tell if drivers and workers using heavy machinery are under the influence, she said. “I am concerned what message we are giving our young people,” Dathan said. She’s concerned about research which shows brains are not fully developed before a person is 25 years old and there may be a social cost to widespread marijuana usage. He’d never support a bill that allows people to grow it themselves, he said, and he believes much can be learned from Colorado’s experience with legalization. Asked about teachers pensions, Lavielle said that there’s a proposal to stretch out the payments on bonds from the Rell administration from the expected 12 years to 30 years. “That adds a cost,” she said, tagging that as $17 billion. Discounting it back to present value would make it $2 billion but “that’s if you believe that that money would be earning 6.9% for the next 30 years, which I don’t,” she said. Previous legislatures and governors ignored the issue for 50 years, and that’s why there are huge cliffs, Duff said. In his view, no one can afford a $6 billion cost in 2032 and therefore the costs need to be amortized. “The state’s annual contribution to the Teachers’ Retirement System is about $1.3 billion, but it could top $3.25 billion to $6.2 billion by 2032, depending on different experts, because of decades of underfunding. Connecticut didn’t start setting aside money to pay for teacher retirements until around 1982,” according to a CT News Junkie report. The state employee pension is going up $100 million a year, Lamont is quoted as saying in another CT News Junkie story. Memo to Senator Duff, Norwalk already has some of the highest property taxes in Connecticut and our house values are stagnating. @Sue Haynie Connecticut is also one of the few states that decided NOT to have teachers participate in Social Security which means some retirees not eligible for Medicare. Also means teachers who may be eligible for Social Security through other work have their benefit reduced due to federal GPO/WEP. Context matters. Neither the Governor nor his “Team” have expressed any major understanding of why CT’s economy has remain stagnant for an entire decade. Excessive taxation at state and local levels and depressed major cities not participating in the hi-tech Computer revolution. One has only to look at Mass and NY to see the major characteristics of powerful State economies. Each has vibrant computer oriented modern cities and world class hi-tech universities public and private. CT has just Yale, a few defense firms and the wealthy Gold Coast dependent on NYC. CT is basically a suburban economy lost in the modern age. That’s why our children leave CT to secure better futures elsewhere. Smoke meet mirrors. Mirrors meet smoke. If the governor’s proposal passes, Wilton might be looking at between $1.75 million-$2.5 million in additional obligations from pension sharing costs alone. Wilton is in for a doozy but already having proactive meetings. What is Bob and Norwalk Town Hall doing? Especially considering Norwalk has the 5th highest average salary $97,164 – a full 23.5% ABOVE the median. Note Wilton is 3rd at $98,594. Norwalk’s Total Pensionable Salary is $92.5 Million, not quite triple Wilton’s. If Wilton is staring down the barrel at $2 Million, Norwalk is what, $5-6 Million? Would be curious to see what Mr. Simms said….oh. Wait. He wasn’t there. I’d like to see more investigative reporting on some of these numbers and scenarios then get Harry’s plans or what-if-scenarios for what is likely coming. By the way, if the transportation fund is insolvent in what some say is 7-8 years, it seems tolls will allow us slow the bleed while not adding incremental funds to the infrastructure. Glad to hear the fundamentals of present value was in the mix. What were Dathan’s and Duff’s thoughts on borrowing against future toll revenues? So before we get a penny for tolls, that clown wants to borrow against said revenue stream. You can’t make this up folks…. Kevin Kane: That is a great analysis. I’d like to hear Lucy Dathan’s opinion on your points. If she’s a NancyonNorwalk Reader, I’d be interested in her view. I welcome Bob Duff to chime in as well. Perhaps the Greater Norwalk Chamber of Commerce and the moderator Harry Carey was trying for a “friendly” atmosphere, and sure – you would expect a COC to focus on business development. I wasn’t there. If anyone was – can you tell me – was there a single question about cutting costs – about improved efficiencies – about challenging state agencies to do more with less? Why are only business and families – when pressed with falling “revenue’s and increased expenses – able to find savings? But never government – never CT.
Have we become so conditioned that we no longer even ask? Nancy’s spreadsheet of answers from the “lightning round” has some amusing responses. 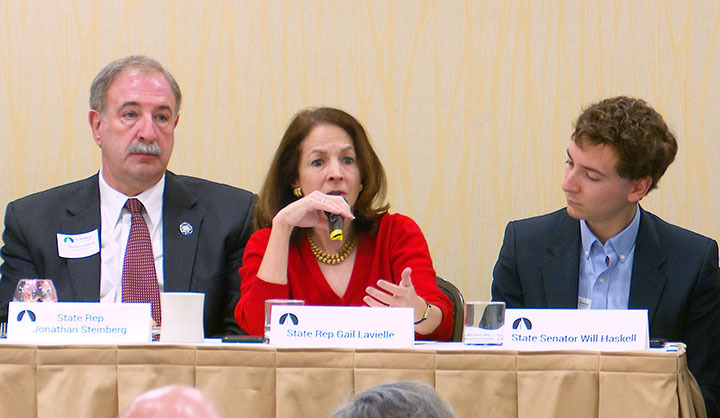 For example, Gail Lavielle’s answer to whether or not the estate tax should be repealed was “Yes-terday”. Harold’s excellent video, at the bottom of the story, captured the whole forum. It is so disheartening to see that one of our few Republican legislators admits to being an ardent “fan” of a demonstrated political adversary of Republican principles, and that both Republican legislators are in favor of new taxes in the form of tolls. This is truly political twilight zone territory. What’s the point of our 25th Senatorial district Republican legislators continuing to be registered Republicans when they’re busy pretending to be Democrats? Republican campaign contributors and voters need to know before the next elections. I agree with Victor. Why are the Republicans on the panel equivocating on tolls? Their answers are not reassuring and somewhat disappointing. This should be a “NO” without reservations. Lamont scammed the voters on tolls and now the Republicans on this panel appear to be being played by Lamont’s charm offensive. Connecticut must do better and tackle structural problems/cut spending and hold the line against tolling. Senator Duff’s answer “Yes” to the question of should recreational marijuana be legalized is a head scratcher. Isn’t Norwalk one of the CT cities suing OxyContin maker Purdue Pharma over the marketing of its drugs which have fueled CT’s opioid crisis? So Duff’s city is suing a company which has promoted and turned a profit on an addictive drug responsible for hooking users who in some cases go on to die, but Duff is onboard to legalize and promote the selling of another addictive drug which in lots of cases hooks users onto addiction to heavier drugs like OxyContin, all in the name of maybe/maybe not boosting CT revenue? How can Duff be against one but for the other? His reasoning as to why he is a “Yes” is reasoning of a herd mentality. He questions that if the other states are doing it, then shouldn’t we, to control our destiny? Interesting point of view and choice of words coming from a Senate Majority Leader of a state which seemingly has no control of its destiny economically anyway with its negative GDP growth rate which Mr. O’Dea points out. Duff’s home city has a negative ROI, gigantic, rotten building at its center which has become a symbol of uncontrolled economic destiny and poor leadership. Maybe Senator Duff should be asking himself, from a humanitarian perspective, at the expense of whom will we be legalizing the sale of recreational marijuana to generate a relatively measly amount of revenue for CT? Anybody who has tragically lost a loved one or acquaintance to overdose due to substance abuse knows all too well that in many cases, marijuana is the gateway drug which opened the door to these people gradually getting hooked on harder drugs, prescription or otherwise, like OxyContin and Heroin, which then led them down a path to serious addiction and/or death. Making a gateway drug even that much more readily available seems like a disaster in the making. I truly hope Senator Duff rethinks his vote.